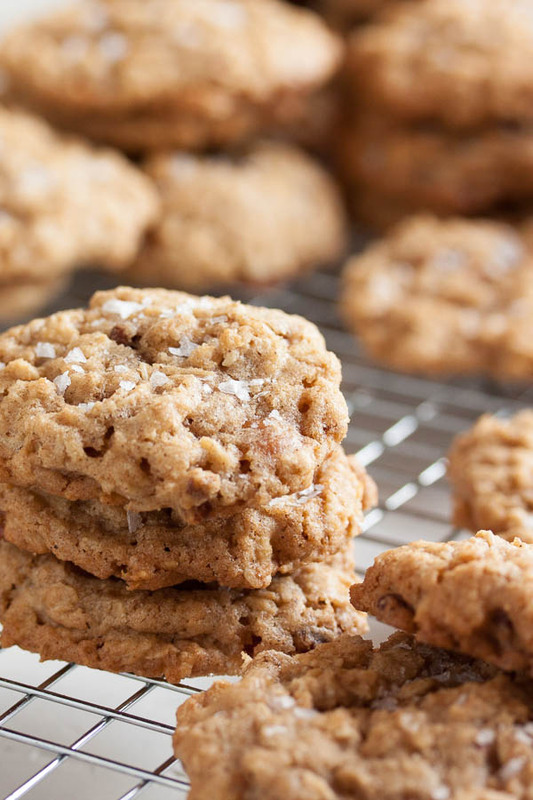 Oatmeal Salted Caramel Cookies | wanna come with? Guess who just got a couple new cookbooks! I’m ridiculously excited. As if I don’t already have a large enough collection, I was browsing Amazon the other day and stumbled upon a book called Cookie Love. Of course I had to have it. And while I was adding that to my shopping cart, The Ultimate Cookie Book popped up in my suggested items. Twist my arm – I guess I had to have them both. I’ll admit, I’ve ordered one or two cookie books over the years that have been a bit underwhelming once I had them in my hands and had a chance to flip through them properly. These two, however, look really promising. Cookie Love is full of unique recipes and flavour combinations, while The Ultimate Cookie Book is a huge collection of traditional recipes and twists on old favourites. I’m looking forward to baking my way through both of them. I already have lots of recipes flagged, but I decided to start with this oatmeal salted caramel cookie. 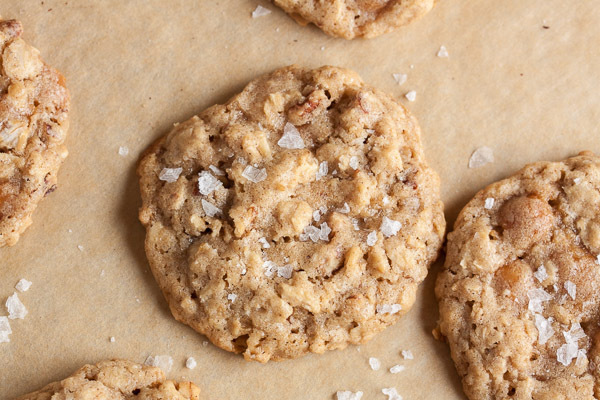 I’m a huge fan of both oatmeal cookies and salted caramels – combining the two sounded amazing. 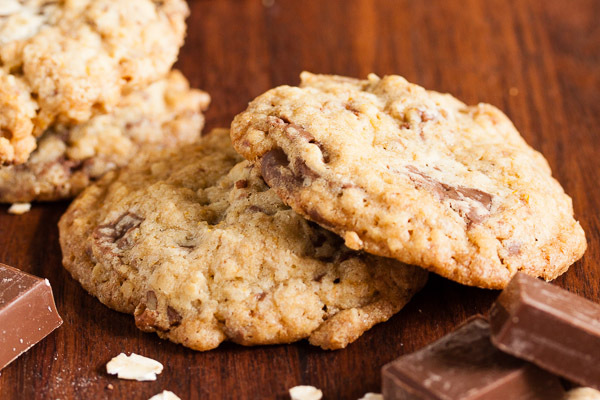 This is a perfectly dense and chewy oatmeal cookie, studded with crunchy pecans and lots of sweet caramel bits. That sweetness is cut a bit with a generous sprinkling of flaked sea salt, but personally, I find these cookies still too sweet. My coworkers, however, disagree. Several people have declared this their new favourite cookie, and there wasn’t a crumb left over by the end of the week. Usually I’ll just suggest letting cookies cool on the baking sheet for a few minutes before moving them to the cooling rack. For these cookies, however, take my advice and let them cool at least 10 minutes before you try to remove them from the pan. That caramel is awfully melty and sticky when the cookies are warm, and your cookies are in danger of just falling apart if you try to move them too soon (yes, I learned the hard way). Also, I would definitely recommend that you use parchment paper for these cookies for easier cleanup. 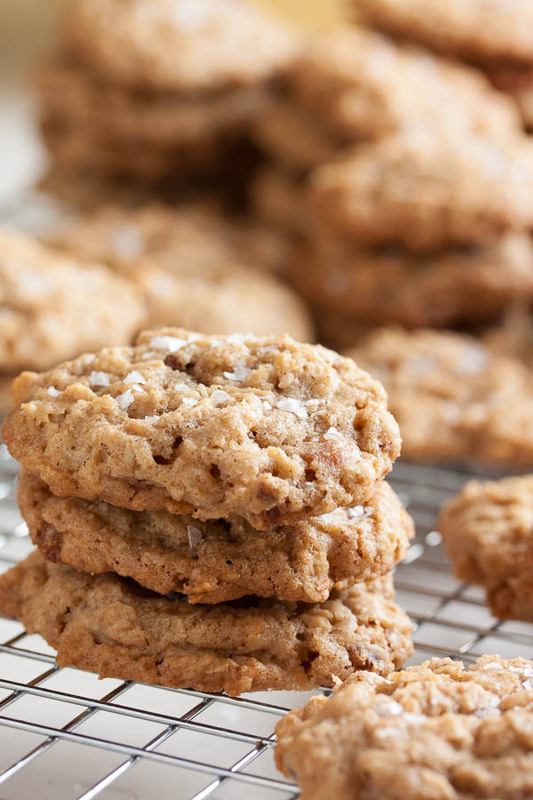 Adapted from "Salty Caramel and Pecan Oatmeal Cookies" from Better Homes & Gardens The Ultimate Cookie Book. 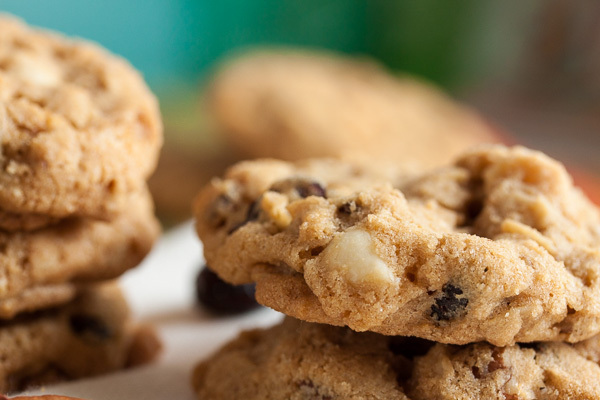 The original recipe says it will make about 60 cookies. I got pretty close to that with 72 cookies using my usual slightly larger than tablespoon-sized cookie scoop. 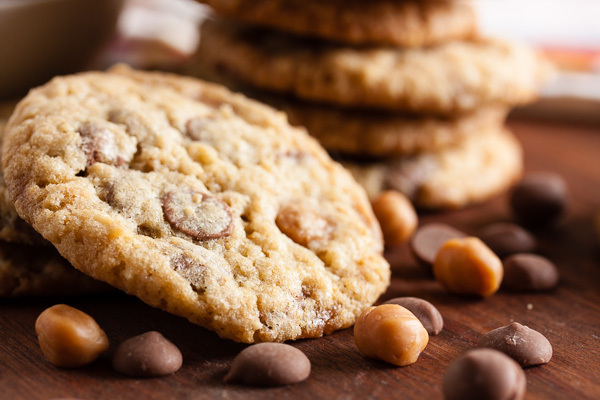 Since the caramel in these cookies becomes quite sticky after baking, I recommend lining your baking sheets with parchment paper or Silpat sheets. In a medium bowl, whisk together the flour, rolled oats, cinnamon, salt, baking powder, and baking soda. Set aside. Turn the mixer down to low and add the dry ingredients, mixing until just barely combined. Remove from the mixer and add in the caramel bits and pecans, either with a spatula or by hand. I prefer to knead inclusions in by hand to ensure they're distributed evenly. Bake for about 12-14 minutes, until lightly golden brown around the edges, rotating the baking sheet halfway through the baking time. After removing them from the oven, immediately sprinkle with a bit of the flaked sea salt. Allow to cool on a wire rack for about 10 minutes before removing the cookies from the pan and allowing them to cool completely.